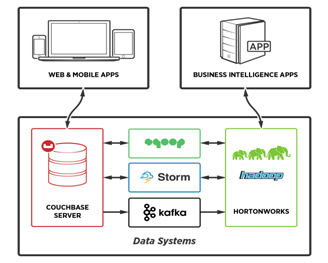 Couchbase has announced integration between its high-performance NoSQL database Couchbase Server 3.0.2 and Hortonworks Data Platform 2.2, an open Hadoop data platform, via distributed messaging with Apache Kafka and stream processing via Apache Storm. By integrating Hortonworks Data Platform and Couchbase Server, Couchbase says, enterprises are able to meet both operational and analytical requirements with a single solution to improve both short-term and long-term operations. Kafka leverages Couchbase Server’s Database Change Protocol (DCP), an architectural feature of Couchbase Server 3.0, to stream data from Couchbase Server to the message queue in real time. The messages are consumed by Storm for real-time analysis. The data is then written to Hadoop for further processing and the analysis is written to Couchbase Server for access by real-time reporting and visualization dashboards, to enable immediate insights. In addition, Hortonworks has certified the Couchbase Server plugin for Sqoop to support bi-directional data transfer between Couchbase Server 3.0.2 and Hortonworks Data Platform 2.2. This integration enables enterprises to export operational big data, produced and consumed by enterprise web, mobile, and IoT applications and stored in Couchbase Server, to HDP for offline analysis and refinement; refined data is imported back into Couchbase Server. According to Couchbase, the result of this closed loop analysis and data insight is that businesses will have the ability to deliver personalized experiences in real time by accounting for context. With its next version, Couchbase Server introduces N1QL, which to put simply is "SQL for documents." N1QL is a distributed query engine with powerful secondary index options and incremental map/reduce views. Join DBTA and Couchbase for a webcast that will explain how N1QL powers next generation interactive applications through its scalability, flexibility, and extensive support for both modern and classic API standards like JDBC/ODBC drivers. The webcast will take place, Thursday, February 19, 2015, at 11 am PT/2 pm ET. One attendee will win a $100 American Express gift card during the live event! Register now. Couchbase and PayPal will demonstrate the new integrations during this week’s Strata + Hadoop World. For more information about Couchbase, go to www.couchbase.com.